Around the same time I bought the L’oreal Eyelid primer, I decided to pick up this setting spray. 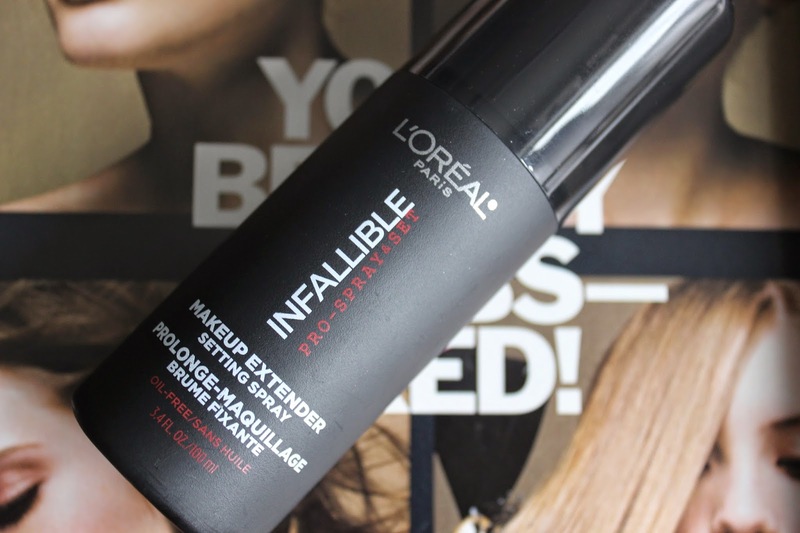 The sleek black packaging drew me in and I was powerless to resist its promise of long lasting makeup. The first time I used it, I was a little freaked out with the aftermath. My face looked wet and my mascara smudged a little under my eyes. This may have been a result of wincing my eyes shut during the spray process. By the end of my 8hr work day, my makeup looked ok and had worn down evenly. However, I did notice a few small red bumps on my forehead. It might have been a fluke because I haven’t seen any bumps after that first application. Now that I’ve used it more, I can say that I like the product overall. While the spray could be a finer mist, the product dries down in about a minute. The mascara smudging has gotten better now that I have gotten used to the spray. It really does help my makeup look better throughout the day. Is it normal for setting sprays to feel so wet or do the higher end ones (Urban Decay All Nighter Setting Spray) leave a finer mist? What's your favorite setting spray? Lastly, do you have any general advice for a setting spray newbie? Yea, I think it's just something I have to get used to. Thanks for the recommendation Jasmin! Looking forward to a drugstore alternative to it! I completely understand where you're coming from Rebecca! I steered clear of setting sprays for ages because I was scared to spray liquid on my freshly made up face. Fingers crossed it goes well for you!